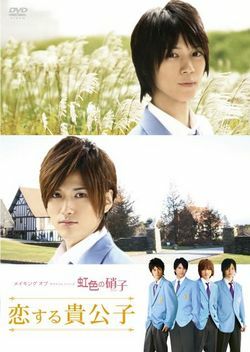 Plot: Set at Shidou Gakuin, a boys' Boarding school, situated off the beaten track. In the second year at school, Takumi Hayama (Yanagishita Tomo) is allocated a room in a dorm to share with Giichi Saki (Kato Keisuke), Aka Gii. Gii was brought up abroad and is the school idol with his exceptional academic performance, as well as his good looks. One day, Gii confesses to Takumi that he has been in love with Takumi for some time. This unexpected truth of events unsettles Takumi, however, he comes to realize the true sensitivity of Gii. Plot: Now that Takumi and Gii are officially a couple, their relationship is put to a test by the presence of a charming newcomer who seem to have caught Gii's interest. Plot: Another school year is starting. Upon meeting up with Gii, Takumi is worried when it turns out Gii has changed, suddenly acting cold and distant. Could their relationship be in danger for real this time? Different from 3 previous movies, this Takumi Pure's movie is focus on the relationship between Arata (Ryouma) and Kanemitsu (Taiki). Started from their 1st meeting when Shingyouji was taken the test to enter in Shidou Gakuen as a junior high student and felt in love with Misu at the first sight. Takumi (Mao), Gii (Daisuke), and Akaike (Takki) want to help them this time. Plot: The last part of the saga brings us back to Takumi and Gee by revealing details of their past.